I recently was asked to hand-letter a vintage globe for an upcoming wedding. I was immediately drawn to the idea, not only as a project I knew I'd enjoy - but as a challenge. I have always had an affinity for maps and travel (and old timey vintage goodness! ), but I didn't want to mess this beautiful blank slate up. So, this was a project right up my alley. During the brainstorming process, the bride and I agreed that the light blue hue of the globe made for a difficult choice with ink. 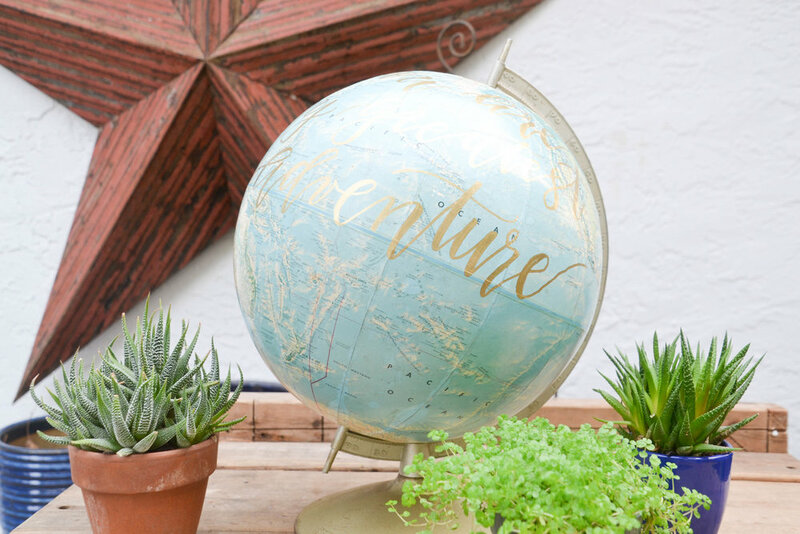 She wanted to go with something classic and timeless, and gold was a first thought - but we were worried that the light-hued blue color of the globe would make it difficult to read. I couldn't think of a better color, though, so we went for the gold. Gold not only worked best with her color scheme - but it added magnificent POP of both old-world romance as well as contrast. In the right lighting, the globe really lends itself to the gold calligraphy. It worked beautifully! 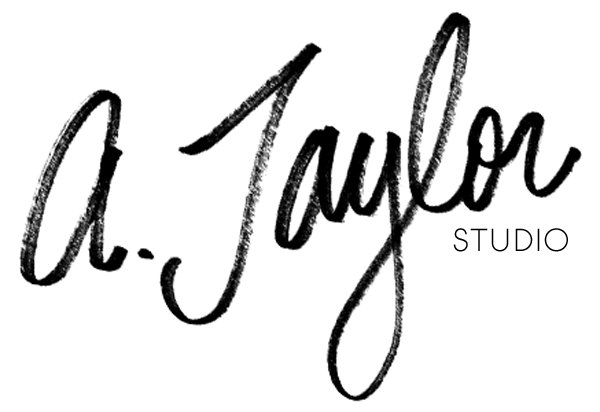 I am so fortunate to work with brides that have such creative ideas! 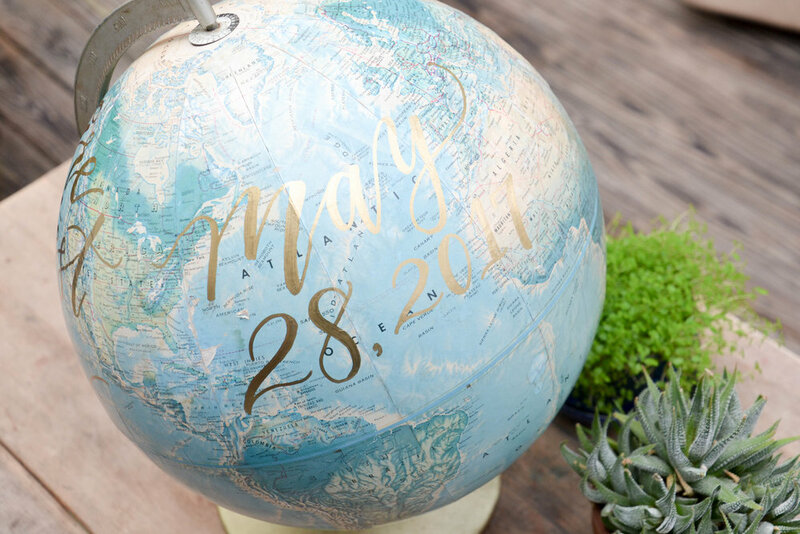 Perhaps my favorite aspect of the globe is its intended function: to serve as a guestbook at this bride's May 2017 wedding. 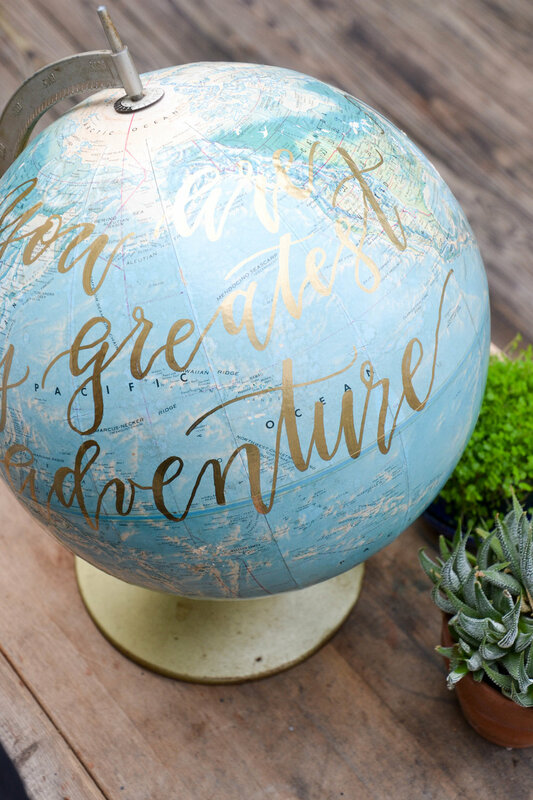 It will be turned, written on, and obviously read: the text reads "You are my greatest adventure" which I intentionally placed over the western hemisphere; the bride and groom are a travel-loving couple that currently live in Southern California. Perfect!